A ground bird's eyeview of the Pyongchon Remian Prugio Apt. Complex to be built in Anyang, Gyeonggi Province. 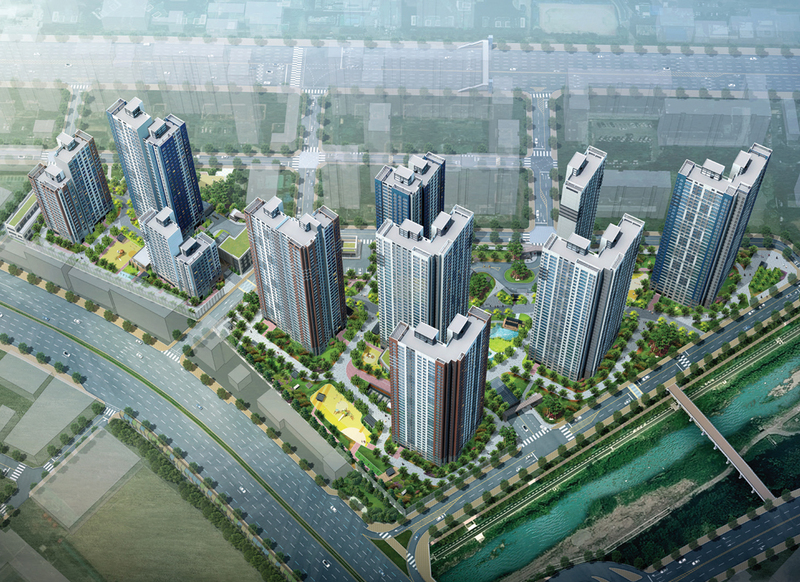 Daewoo E&C and Samsung C&T will allocate apartments built jointly in Anyang from March 22. The apartments total 1,199 units and are in ten 37-storey buildings. The apartment sizes range from 59 to 105 square meters and are located in the joint residential complex named Pyeongchon Remian Prugio. They are being built in the No. 2 District’s 30-419, Dongan Ward in Anyang, Gyeonggi Province. 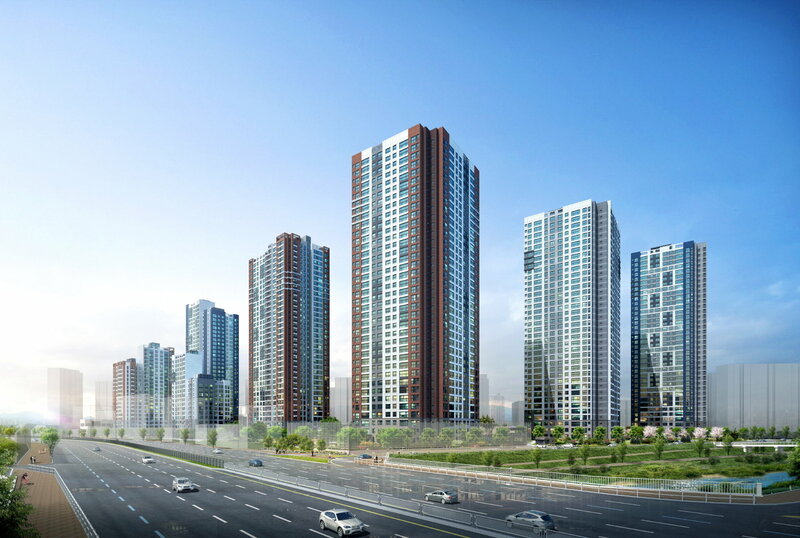 The construction companies whose apartment brands go by Remian for Samsung and Prugio for Daewoo will allocate 659 apartments to general applicants. There are 196 apartments that are sized at 59 sq. meters, five that are 68 sq. meters, 353 of 84 sq. meters type, 44 in 97 sq. meters type and 61 with 105 sq. meters in space. The models of those residential facilities will be displayed at 9-859, Seoksu-dong, Manan Ward, in Anyang, near the No.5 Exit of the No. 1 Subway Line KTX Gwangmyung Station. Residents can move into the apartments from November 2021. Call 1800-4040 for more information. The apartment complex is surrounded by a number of primary, middle and high schools, including Anyang Chungang Primary School, which is connected to the complex thru an underground passage, along with other well-known schools such as Buhung Middle and High School and Burim Middle School and Pyeongchon Middle and High School, among others. The apartment complex is also surrounded by scenic nature and pleasant infrastructure with the Hakui Stream flowing by its frontal side offering nice walking spaces along the stream, which also provides views from some apartments in the complex. Also nearby are a number of public parks, Hakun, and Woongok and Mt. Gwanak, one of the most famous hills around Seoul. Accessible easily from the complex are a number of department stores and super markets such as the Lotte Department Store, the E-Mart, and the Homplus. Also located closely from the complex are the Anyang St. Mary’s Hospital, the Anyang City Hall, and the Dongan Ward Office. Making the approaches to the complex easier are a number of state-highways passing thru Anyang including the Seoul Outer Circulatory Expressway (Pyeongchon Interchange), the No.1 State Highway (Kyongsu Grand Highway), the No. 47 State Highway, making the approaches to Seoul and the south of the capital excellent. The complex is closely located from the Anyang Station of the No.1 Subway Line and the No. 4 Subway Line of the Bumkae Station. The Wolgok-Pankyo Subway Line which is being planned to be built soon will be accessible at the Anyang Playground Station when it is completed and opened. The apartments will be equipped with various convenient facilities such as special spaces in the entry halls and pantries, also dressing rooms. The complex will have a number of community facilities including a library, a study room, a fitness room, a golf practice facility, a conference room, and the child care facility among other community facilities. The builders also paid a lot of attention on security facilities in the complex such as the installment of CCTVs in key spots in the complex including parking lots and the facility to control the cars coming in and out of the complex underground parking lots with the system to recognize the plate numbers of the cars and unmanned security systems and the emergency bells, in addition to the unmanned delivery system inside the complex for the sake of safety and convenience of the residents.